Oh hey I never told you (mysterious anonymous possibly nonexistent internet readers) about how we're actually using the master bedroom as a bedroom now instead of a storage room. Guess what? I have more phone pics! Ok this is old news, but the 5'3" closet with the skinny 2' door has been opened up and fitted with a wire Closetmaid rack from Home Depot (wish I could use Elfa, but we are le cheap sometimes and Elfa is le expensive and we don't know if we will be staying in le houzze long enough to make it le worthwhile... I will le stop now). The week before Memorial Day we hit up The Original Mattress Factory and The Mattress Firm and scored a memory foam mattress for sort of cheap I guess; I dunno, they were having sales and I won't break it down but I got a sweet coconut-oil-infused memory foam pillow out of the deal so I'm happy. 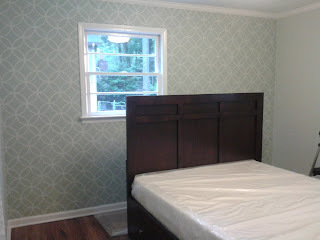 The mattress is still in plastic here because I was finishing up the stenciled back wall. Oh yeah and our bed arrived and so that was hanging out in the middle of the room. Our bedroom is tiny so it took up pretty much all the space; it's better now but that's why we really needed drawers (see next pic). The bed has 6 of these big drawers (cedar lined, oooOOOooohhh). Chris gets 2, the extra bed linens get 1, and I get 3. I like how 50/50 is totally not 50/50 when it comes to closets and dressers. 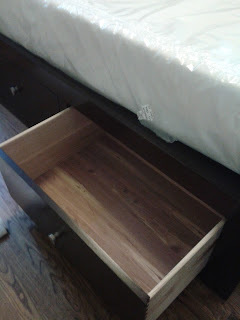 I have already fit all of my boots into one drawer, and need to mash the winter comforter in another drawer. Maybe I should get one of those vacuum bag thingies. I have a coupon from Bed Bath and Beyond. Yeah, I'll do that. So, not thinking out loud anymore... since these pictures were taken (because I am always behind) I have decided on a dresser for the room, side tables, and have purchased sheer curtains and gray curtains for the windows. We're not putting the old blinds back up because they are off-white and look really dingy next to the freshly painted crisp white trim. So, sheers it is. I love that we get tons of sun in the morning in this room; helps me wake up for sure. 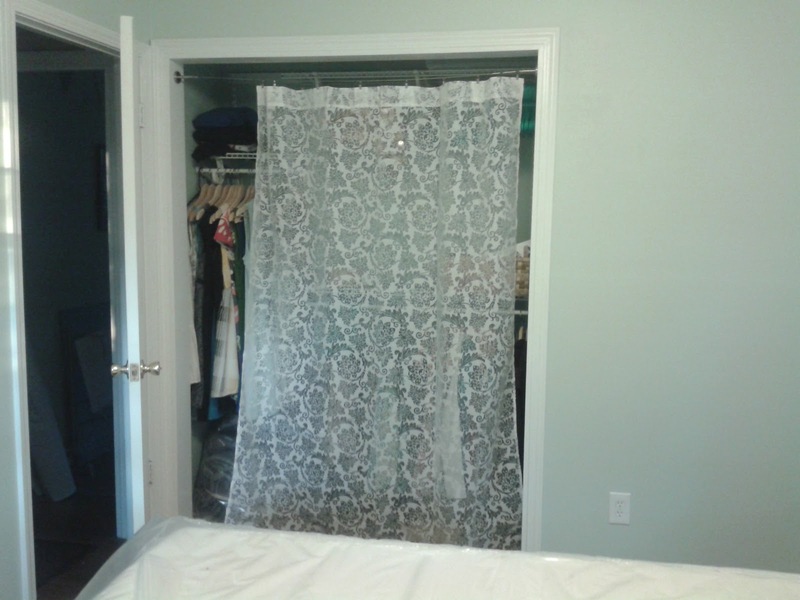 Oh and the curtains are these from Target. I got 84" originally because the sheers are 84" but they were too short! So I went back and got 96" so they are hung right below the crown molding. Well, they would be hung except the curtain rods I bought (28"-48") are not long enough so I have to go exchange those now. Also I am ironing the curtains before I hang them, which is a pain but sooooo worth it because they look so nice and smooth when they're hung. And here is a super-professionally-done screenshot of my Pinterest board where I tried to figure out what dresser and side tables I wanted. Click to make it bigger. Circled in blue are things we have already or have been ordered. X'ed out in gray are things I considered but ultimately discarded. Oh oops forgot a gray X on the quilt on the right and the table in the top middle. I ended up ordering that colorful Georgia print on the bottom from Etsy, but of Texas instead. Follow me on Pinterest! I'm anniejw17. And that's it for bedroom progress. Once it's all finished I'll be sure to take more pics but with a better camera (haha, my Nikon coolpix, super professional). I also took pics of the kitchen because I realized I never posted finished* pictures of the whole thing. Someday I'll get around to posting those. *I say finished because nothing is ever really finished, right? This month I seriously need to finish the mudding and sanding over in the kitchen nook. You can see it in the pic of Hula on Jezza's bed. Gah it's ugly and has been like that for a friggin' year. Annie J. Wyatt, procrastinator extraordinaire.